Jolly Roger sets sail on Thursday! The Jolly Roger I is fresh from a major rebuild and refitting and she’s ready for her first commercial cruise on Tuesday morning. ﻿The Barbados Rally Club sampled The Jolly Roger’s hospitality last weekend and a fantastic time was had by all. The ship will host regular 4 hour cruises on Tuesdays and Thursdays. How about a blog for Black Pearl Party Cruises? The website for Black Pearl Party Cruises – the Barbados company that runs the Jolly Roger – is a little basic. No doubt Captain Shane and his partners have some grand plans that will take a while to kick in, probably with online bookings and all that. In the meantime, they should consider throwing up a blog at WordPress because it could be done in a day. Call it the “Captain’s Log of the Jolly Roger” or some such name, and do one short entry every day about the boat, the crew, the trips, some movie star that they saw on the beach as they went by Sandy Lane or some little happening. Keep it light, photos of the boat and Barbados as seen from the boat. Profiles of the crew. Comments from passengers, stories of first timers to Barbados. Adventures finding the boat, getting it rebuilt and getting it to Bim. Yup, I could see that blog being picked up by Google, and with Facebook and Twitter establishing the Jolly Roger’s serious presence on the internet and in Barbados tourism virtually overnight so that any tourist thinking of coming to Barbados would be bound to stumble across the Jolly Roger and decide to take a cruise while on the island. That’s our suggestion and we promise to Captain Shane and the good crew that if they put up a blog, we’ll regularly link to their stories. That goes for any Barbados business, because these are tough times and we will help where we can if asked. Is Barbados cleaning up the legal profession… finally? We’ve had so many lawyers arrested in the last year and a bit that outsiders might begin to suspect that mass criminal hysteria has recently hit our legal profession. That observation would be wrong because the activity did not start recently – it’s been happening for a long time, but in the past it was always concealed. The truth is that these kinds of arrests simply never happened until recently because the lawyers and judges looked after their own. Out and out thieves like (Insert names here, we don’t have time!) misappropriated clients’ trust funds and, if caught, at the most had to pay some money back without even a suspension let alone jail. Arrests all for show? Deals still made? Nevermind all the recent arrests though – I can’t think of any crooked lawyer who went to jail. Can you? I guess it’s better than no charges at all, but I think this is the stage in our society where our glorious leaders have decided to make a show of arresting crooked lawyers – but then deals are made and the stories fade away. Of course, I’m just throwing our readers a bit ‘o humour, cause everybody know that Mr. Leroy Lynch is innocent until proven GUILTY! GUILTY! GUILTY!!! The above video shows the moment the reactor containment building blew up. Now that most of us are up and following events through the regular news channels, we’ll unstick this from the top and put it back into the chronological order. 10:01 GMT (06:01am Bridgetown) (Reuters) – Radiation leaked from an unstable Japanese nuclear reactor north of Tokyo on Saturday, the government said, after an explosion blew the roof off the facility in the wake of a massive earthquake. 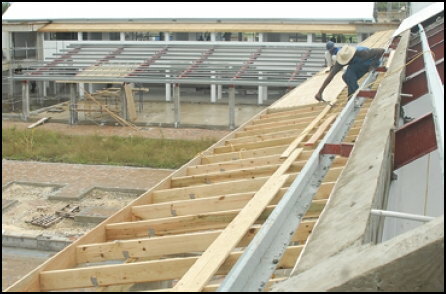 Barbados school: Built with Untreated ordinary pine? Tax dollars put into materials that quickly rot out? We’re spending millions of dollars and I think I see much of the construction being done using cheap ordinary, non-pressure treated pine. I see a few pieces of pressure-treated wood but that emphasizes that the majority of the wood is ordinary. It looks that way to me.